There is a serious misunderstanding being propagated with misidentifying who it is we are actually talking about. 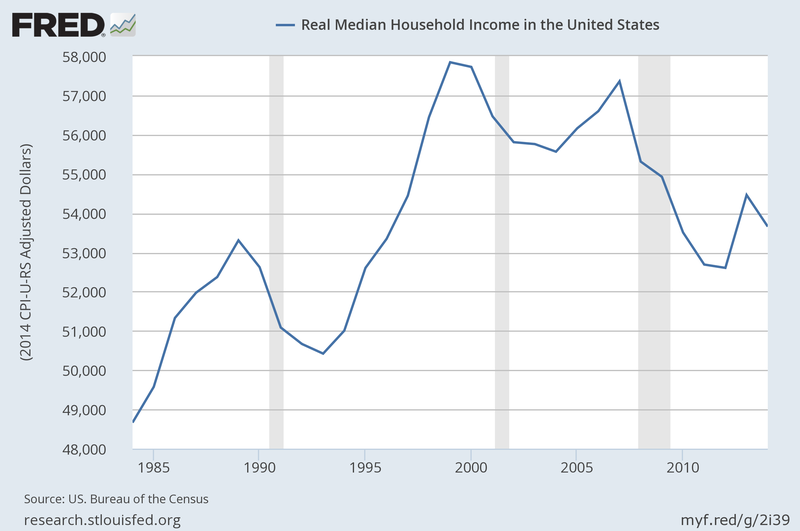 This is NOT the “middle class” that is being disenfranchised and shrinking. It is the skilled working class. The true middle class, as it was understood in the 19th Century are doing quite well. Our better educated, professional class, the true “middle ” class, the “bourgeoisie” between the workers and the capitalist (rich enough to live off of non-employment income) classes, are doing extremely well. But those who have only a modest education and rely “on the sweat of their brow”, even in highly skilled trades is loosing ground. 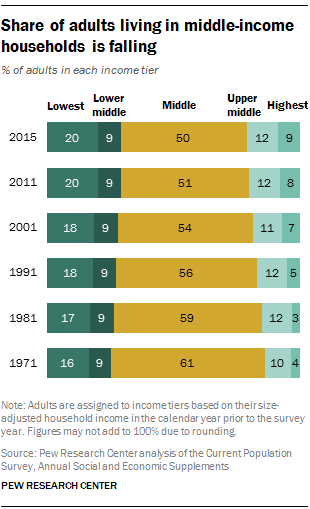 Calling them the “middle class” distorts the picture of who they really are and why they have been losing ground for several decades as increased productivity has reduced the demand for their labor and thus reduced their share of GDP. Strange how everyone,including the media, constantly boasted of U.S. prosperity. The only problem with that is they never identify the period in which this prosperity happened. Post WW2? Maybe, yes, jobs were aplenty, economy was booming. But for who? White middle class and the very rich 1%. Did the black population “prosper” post WW2? Well, no, and they represented 15% of the population, fully 35 million+ people. Add the perpetually poor and intellectually-challenged to the equation and you get 25% of the population that did not enjoy this short-lived prosperity. And, back to “prosperity”, what other age of prosperity did the U.S. population enjoy? Well, the answer is simple : Never. Same in Canada but slightly better as we had no black minorities. We preferred torturing our native peoples. Old-time prosperity in the U.S., is a myth. Happened piecemeal from 1945 to 1970 only. Europe, with its post-war rebuilding and lack of natural resources, fared much better. It was called, still is, socialism which btw was as corrupt as capitalism, but which left a few crumbs for the embattled middle class. Not so for trickle-down economics as mentioned in the above well-done piece. Trump will be an unmitigated disaster. Him a Wall Street foe? Make me laugh. He has thrived from Wall Street, has been financed by Wall Street and taught how to effect successful bankruptcies by those same people, to stiff employees, suppliers, pension funds. All aided by added Chinese financing. The man is pure hyperbolic buffoon. He knows nothing of politics and economics and has probably been a money laundering front from the beginning. I don’t believe very much in God, but if there is one, God help the U.S. In the New Republic, members enjoy resuming the restoration of the Constitutional republic from JFK’s point of interruption, can see for miles and miles, and enjoy Liberty in building out properties and the local means of production, with the capability to sow, nurture, grow, harvest, store, cook, engineer, design, program, automate, construct, process, raise, teach, hunt, defend, provide, debate, organize, compose, dance, celebrate, and sustain. I’m Charles Fuller, and I approve this message, from the beginning. i really encourage you to look at the American National Elections Study – i think you will find the data interesting. The voters seem to have lashed out in ignorance and rage, and they do not yet understand they have punished themselves. If you think they were angry last week, just wait until they realize they were conned. Would anyone be surprised when Trump starts talking about the need for a state of emergency to fix the problems. We have to hope we have the opportunity to remove this sociopath in the future, but we may not get one.